What’s up everyone?! So I’m writing here because I recently got a chance to go to one of my favourite places, the food capitol of Asia – Penang! I went with Air Asia for a #AirAsiaHolidayQuickies that for a short 2D1N trip and had such a good time! It’s my fourth time in Penang and I quite sure I had seen all that needed to be seen BUT I am so happy to be wrong. So, I wanted to share with you what you can get up to if you’re planning a quick holiday getaway for say, the weekend! And of course, if you haven’t already seen it, you can check out my Instagram video for a more visual experience. This place was definitely old-school charm meets new-world modern. 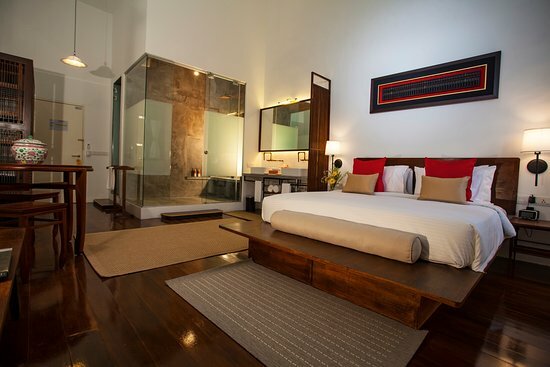 Even though the interior of the room was modern with super comfortable beds, a pillow menu, beautiful lighting, and a very industrial modern shower, the actual structure of the building and the room remains untouched and preserved. This is common in Penang and to me, something they have done brilliantly. Rooms have refrigerators one every level where guests have full access to the beverages inside. Well, tucked behind the hotel is actually the Clans Kongsi Temple that has a little museum at the ground level telling you everything you want to know about its rich history. Not to mention, the intricate design and make of this temple is well-maintained and a feast for the eyes. Seeing that it’s my fourth time in Penang, here are a few recommendations for food to check out! There are many extensive lists online you can find but here’s mine! Why do I love it so much? Potent prawn broth, the wonderful option to add on roast pork, intestines, and other porky goodness! I will not bore you with the history of Nasi Kandar, but for Singaporeans, it’s KINDA like Nasi Padang or basically, Malay Cai Fan which was so shiok. I’ve got 2 recommendations, the first of course is the famous and the oldest Nasi Kandar stall in Penang. I am here because the food is spicy, rich, and there’s a huge variety of what you can eat. Plus, they’ve expanded and now you can escape the torturous heat and have a nice time indoors under the a/c. Come here if you like Ayam Goreng or fried chicken cos their fried chicken is so good! 3. Char Koey Teow that’s Worth the Calories! Wow, I do not have words for this place man. Since finding her stall the first trip here, I still love what she serves up – Thicc juicy prawns, salty, spicy, and piping hot. This does the trick for me. Finally!!!! You have to check out the view at the top of Komtar! There were high elements course which I had no guts to do but makes for a great memory. If you’re afraid of heights like me, popping up onto the top of the tower for an Instagram moment should be no issue!!! Again, I was really amazed at how much Penang has changed and just how much one can experience with an #AirAsiaHolidayQuickies – it was short, sharp, fulfilling, and suitable for my hectic and erratic schedule! Check out the AirAsia website here to book yours today! And of course, don’t forget to head to my Instagram to check out the highlights of this trip! !